This is an unofficial translation of the rules. The only official version of the rules in cases of misunderstanding is the Slovak version. To build a autonomous mobile robot, which will travel the whole defined path in a certain time. The direction and course is defined by the dark line, also some obstacles are presented. Topic of the year 2014: There and back again. The background of the path will be white with dark (black) navigation line on it (width 15 +/- 1 mm). Total length of the path won't be more than 20 meters. Material used will be a chipboard. The smallest radius of curves used in the path will be 5 cm Total rising of the path won't exceed 3 cm; maximal rising or declining is 5%. Like in the real life, there can be random obstacles in the path (interrupted navigation line, obstacle on the line, illumination changes and other). The robot's task is not to find the right way, just to follow the navigation line. The line remains unchanged for the duration of the competition, so robot can learn from previous runs and for example complete straight stages in a faster time. The robot starts within the starting area, which is 30 cm before the start line (infrared beam of the time measuring device cca 10 mm above ground). When the beam is interrupted by any part of the robot, the time starts to be measured. The path is closed (round), and in the start (that is also the finish) area will be short (10 cm) perpendicular dark stripe on the line located. This stripe will mark the start/end to help recognize it for fully autonomous self-learning robots. So can the robot better utilize the information from previous runs. 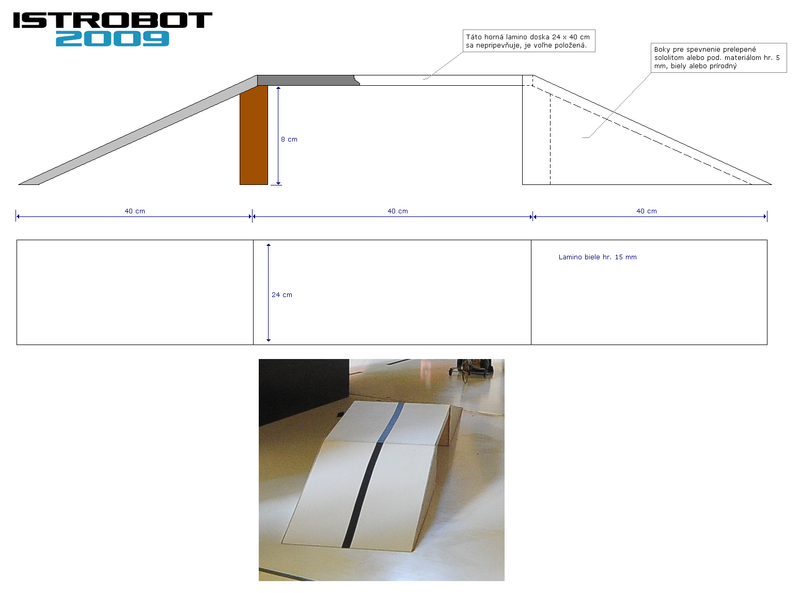 If the strip is not necessary, the robot can start just after the strip on the path. The time measurement is stopped when the similar beam of light located at the end of the path is interrupted. There are no barriers at the edge of the contest area. On the each side of the dark line will be the 15 cm wide safety area. Nevertheless, it is recommended to implement the safety device to avoid the fall from the edge. Organizers can not guarantee that area around the arena will be open. Hence the authors used to carefully evaluate the sensor measurements, especially near the arena edges. L1: There can be a tunnel in the path (of minimal dimension 20 x 20 cm). L1: There can be a reflector shining on the path. 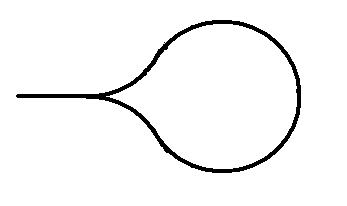 L1: The line can be forked on certain place, whereas the length of the both segments is not necessarly the same. L2: Anywhere can be placed the obstacle brick. This obstacle used to be avoided. The robot has to return to the black line max. 30 cm after the brick. 2014 - L3: There can be a new obstacle on the track - curtain. It is possible to drive through it or avoid it to continue the tour. 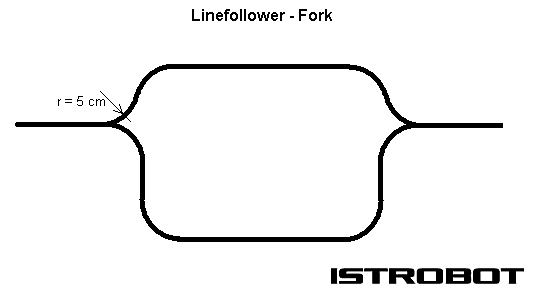 2014 - L3: At the end of the track there will be a return loop to return the robot back to the track in reverse direction. 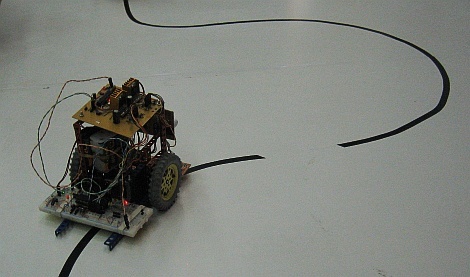 There must not be any interference between the robot and its team after the robot is set in the starting circle and turned on. The robot must be controlled only by its electronics. The robot may not leave the line after crossing the starting line. Avoiding obstacles is the only one exception. While moving, the robot may not leave any marks or beacons on the table. No parts can remain on the path during the run. The competitor is disqualified when the competition path is damaged. The width and height of the robot cannot exceed 20 cm. Length of the robot is not limited. Please, notify the limits given by tunnels and circle radiuses during the run. Minimal dimensions and weight are not limited. The competitors must be prepared to the start within 1 minute after the call. Every robot has total 3 runs to compete. But if the competitor does not present within 1 minute after the call, the run is lost. The time between the runs can be used for fixing and adjusting the robot. In the case of too many competitors, the jury can decrease the number of runs, or it can proclaim a qualifying round. The robot has 3 minutes to complete the path. After 3 minutes, the time measurement is stopped and the run is canceled. But the robot is not disqualified. The time stop has no affect on the next runs. 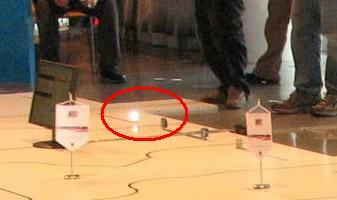 When the robot turns back at the line interruption, it will be evaluated at the easiest level L1. 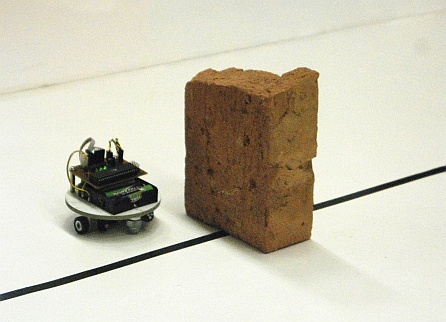 When the robot turns back at the brick, it will be evaluated at the middle level L2. When the robot successfully drives over all the obstacles, returns back at the return loop and safely returns home, it will be evaluated at the highest level L3. The winner is the robot with the shortest time from any of the three runs. Second and third place will not be evaluated. Robot will be always evaluated at the level where it obtains the best result. Unfinished run will not be evaluated. The jury can also award the robot with the best design or interesting construction.